Fourth-and-two: fourth-and-nine : fourth-and-one – if Bishop Diego had been able to stop Santa Clara in any of those situations, the Cardinals might be CIF Mid-Valley Division football champions. Instead, the Saints converted on all three plays, leading to the tying and winning touchdowns, and Santa Clara defeated the Cardinals 20-14 in an overtime thriller Saturday night at Moorpark College. Bishop’s defense still put forth a valiant effort against a Santa Clara team that was averaging 49 points in the playoffs and had rung up 42 against the Cardinals in October. 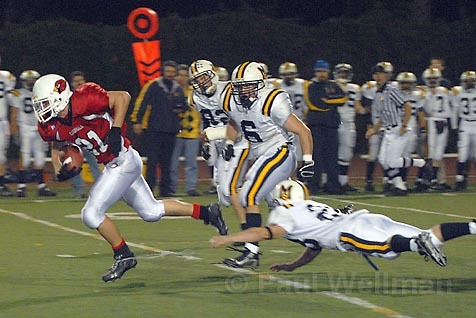 Cierre Wood, the Saints’ mercurial junior whose picture adorns the latest issue of Sports Illustrated – wherein he is touted as the nation’s top running back in the class of 2009 – had Cardinals hitting him from all angles. He ground out 211 yards on 29 carries, less than half his gaudy 16.5-yard average. Wood, who had scored six touchdowns against Bishop the last time they met, did not reach the end zone until the final two minutes Friday night. But, oh, those fourth downs. Santa Clara trailed 14-7 and faced a fourth-and-two at the Bishop 28 yard line with 2:27 remaining in the game. Wood, forced inside most of the night, put on a burst of speed around right end and gained 18 yards – his longest carry of the night – for a first down at the 10. Two plays later he slashed through the line for a seven-yard TD, and the Saints tied the score 14-14 with 1:38 to play. Bishop Diego's Aaron Skinner was slowed down by Mary Star of the Sea's Joseph Ponce in the Cardinals' 36-0 victory over the visiting San Pedro team on their warpath to the division championships. Bishop’s last offensive series of regulation went nowhere – the Cardinals gained only 14 yards and one first down in the second half – and the game went into overtime. Santa Clara had the ball first at the 25 yard line. On second down, Bishop’s Don Deaile, a fireplug of a lineman, dumped Wood for a five-yard loss. Someday, when he watches Wood on national television, Deaile said, “I can say I took him down in overtime.” Santa Clara then faced fourth-and-nine at the 24. Quarterback Randi Vines faked a handoff to Wood, who was pursued by a host of defenders around left end. That left a vacancy on the right side, and Vines ran 14 yards to the 10. Three plays later, it was fourth-and-goal at the one-foot line. Vines took the snap and dove over center into a pile of bodies. The officials reacted ambiguously, neither signaling a touchdown nor ruling Vines down short of the goal. Only when the ball was placed on the three for the conversion was their decision revealed: Touchdown. The Cardinals did stop Wood when he tried to run for a two-point conversion, leaving them six points behind when their turn at the 25 came up. If they had needed just a field goal, they could have run the ball. Needing a touchdown, they tried to throw it. Santa Clara’s defense put fierce pressure on quarterback Christian Winnewisser. After an incomplete pass and two sacks, the Cardinals were backed up to the 34. Appropriately, Bishop’s championship bid came down to a fourth-and-19 play. Winnewisser had time, and he launched a deep spiral. Wide receiver Jeremy Kjar got his hands on it, but as he tried to secure the ball, defensive back Dyrell Lackey hit him from behind. They fell into the end zone, and the ball popped out. Incomplete. Game over. While the Saints celebrated in the middle of the field, the Cardinals somberly gathered off to the side. Head coach Tom Crawford quietly expressed his pride in their season – 11 wins, three defeats (or was it two and a half?) – the school’s best ever. Two scoring runs by gritty Aaron Skinner in the second quarter put the Cardinals ahead 14-7. Both times, Santa Clara’s defense was lured in one direction, and Skinner burst through the line the opposite way. He scooted 24 yards for the first touchdown, and 74 yards on a scintillating dash just a minute before halftime. Kjar fended off the last Santa Clara defender with a shot at him. 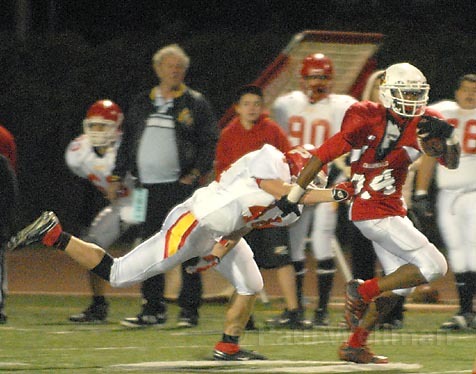 Bishop Diego senior Eli Orosco goes for a touchdown against Paraclete in the division semifinals. The Cardinals went on to win 12-6, earning their game on Saturday night against Santa Clara. Bishop had one other big gainer, a 26-yard sweep by Eli Orosco that set up the first score. For the majority of the game, the Cardinals’ defense was on the field, grudgingly yielding yardage and then becoming adamant in the red zone. Skinner intercepted a pass at the two yard line. Kjar picked one off for a touchback. Down to that most severe of downs, the do-or-die fourth.